Chicken Bacon Halloumi Peppers and Onions Skewers - It's BBQ Time! We bought a new BBQ a little while ago but ever since (in true UK style) the weather has been cold. Last weekend we finally had summer, but everyone's now wondering if that was our summer! Anyway, we had a few really nice hot days and at last, two days in a row out came the shiny new BBQ. Chicken, bacon, halloumi cheese, red peppers and onion. One big skewer each - along with some other good stuff of course! I have these metal skewers that must be a foot long and felt the need to fill them up. You can of course use wooden ones but be sure to soak them overnight in water or they will catch fire! No fancy recipe - just use whatever you want. Put the corn into foil parcels with a good knob of butter, salt and pepper and a few dried crushed chilli pepper flakes. Thinly slice some red peppers, tomatoes, onions, garlic, chilli pepper (seeds removed and chopped finely). Throw the lot into foil trays and drizzle with a little olive oil. Let it cook for a while before adding two thinnish slabs of feta to each and sprinkle with dried Greek oregano, drizzle with a tiny bit more olive oil. Serve just when the feta begins to melt. In cooking order, the sweetcorn will need to go on first. Then after 10 minutes put on the tomato and peppers without the feta and stir that about every now and then. After about 15 minutes add the chicken skewers and start to cook. Add the feta to the tomato pepper dish - move to the side whatever is getting too done. While the skewers are cooking, serve the pepper and tomato dish with some nice crusty bread. Just be sure to keep an eye on them and turn so they don't burn. I have these metal skewers that must be a foot long and felt the need to fill them up. You can of course use wooden ones but be sure to soak them overnight in water or they will catch fire! No fancy recipe; just use whatever you want. Wrap each one in cling film and pop into the fridge - remove about 15 minutes before you cook so they lose the really cold chill from the fridge. No need to oil - just pop onto the BBQ making sure the charcoal is ready - it's only ready to cook when all the coals have a covering of grey ash. 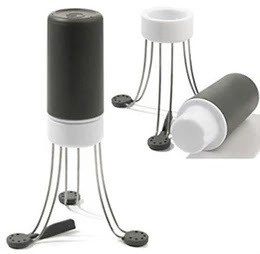 Now if you use a charcoal BBQ and don't have a chimney starter get one now. Amazing gadget! No more waiting about and only having half the coals going. Put everything alternately onto your skewers folding the bacon around as you go. * In cooking order, the sweetcorn will need to go on first. * Then after 10 minutes put on the tomato and peppers without the feta and stir that about every now and then. * After about 15 minutes add the chicken skewers and start to cook. * Add the feta to the tomato pepper dish - move to the side whatever is getting too done. While the skewers are cooking, serve the pepper and tomato dish with some nice crusty bread. Just be sure to keep an eye on them and turn so they don't burn. What a gorgeous BBQ'd meal! I can see that your charcoal grill is brand-spanking new, she's a beauty! The skewers look delish and Halloumi rules again! We've been having nice weather here too but just in case it leaves as fast as it came, I better get one soon. I really like the sound of adding halloumi to the skewer! Yay for bbq season Jan! Your photos look really good!